Insulin is a hormone normally produced by the pancreas. 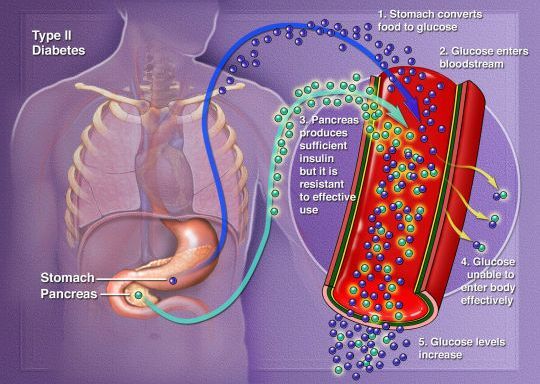 Insulin helps your body convert food into energy. Without insulin, glucose (sugar) from food cannot enter cells, and glucose builds up in the blood. Your body tissues become starved for energy. Type 2 diabetes is primarily a disorder in which the cells are not responding to the high levels of insulin circulating in the body. The body becomes increasingly resistant to insulin. As type 2 diabetes progresses, the over-worked beta cells of the pancreas start to make less insulin. People older than age 45 years are at higher risk of developing this condition, but it can occur at any age—even during childhood. Excess weight and obesity is the primary cause of insulin resistance, and it increases the chance of developing type 2 diabetes. If diabetes is left untreated, serious health complications can occur. These complications affect the eyes, heart, kidneys, blood and nerve supply, and immune system. What are the risk factors for type 2 diabetes?What are the symptoms of type 2 diabetes?How is type 2 diabetes diagnosed?What are the treatments for type 2 diabetes?Are there screening tests for type 2 diabetes?What are the complications of type 2 diabetes?How can I reduce my risk of type 2 diabetes?What questions should I ask my doctor?What is it like to live with type 2 diabetes?Where can I get more information about type 2 diabetes? Diabetes mellitus type 2 in adults. EBSCO DynaMed Plus website. Available at: http://www.dynamed.com/topics/dmp~AN~T113993/Diabetes-mellitus-type-2-in-adults . Updated August 29, 2016. Accessed October 6, 2016. Type 2. American Diabetes Association website. Available at: http://www.diabetes.org/diabetes-basics/type-2/?loc=DropDownDB-type2. Accessed August 22, 2016.